He has no relationship as envisaged in Art.134, paragraph l of the CPP. 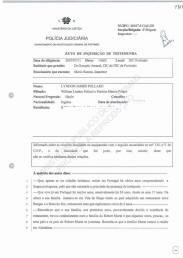 --- That, despite being a British citizen, he resides in Portugal for several years understanding the Portuguese language, therefore does not need and dispenses with the presence of an interpreter. 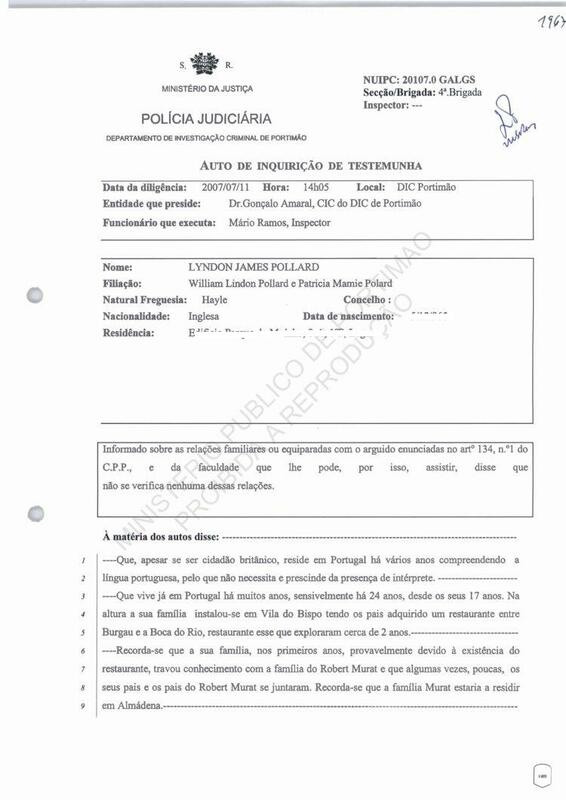 --- That he lives already in Portugal for many years, specifically for 24 years, since he was 17 years old. At the time his family settled in Vila do Bispo his parents having bought a restaurant between Burgau and Boca do Rio, a restaurant they had exploited [run as a business] for about 2 years. --- He recalls that his family, in the early years, probably due to the existence of the restaurant, got to know the family of Robert Murat and that sometimes, a few, his parents and the parents of Robert Murat got together. He recalls that the Murat family were living in Almadena. --- Of these meetings, he vaguely recalls the older brother of Robert, whom he knows is called Richard, because he was the closest in age to him. He knows that they have a sister but does not remember her at that time as well as [nor] Robert, who was a child at the time. --- The question asked about if he had knowledge about sexual relations between Robert and animals, namely cats and dogs, he said to be completely unaware of those episodes, reiterating that his relationship with Robert Murat was non-existent. --- He said he knew relatively well a person called Carlos Costa he being, at the time they arrived in Portugal one of the few people who spoke English in Vila do Bispo. He became a friend of Carlos Costa and other boys from Vila do Bispo. --- He recalls that, once, all of them got together, the witness, Richard and Carlos Costa, on a beach near Vila do Bispo, where there were still more people in the group. 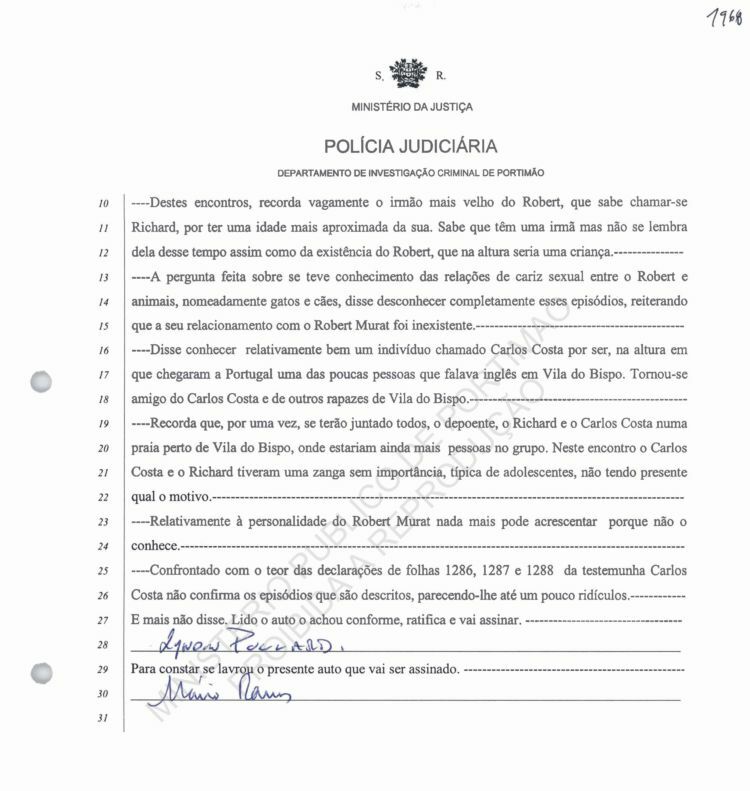 During this meeting, Carlos Costa and Richard had a fight of no importance, typical of adolescents, it having no cause. --- On the personality of Robert Murat he can add nothing more because he does not know him. 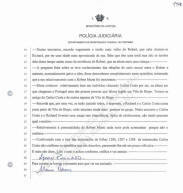 --- Faced with the contents of the statements [of the witness Carlos Costa] on pages 1286, 1287 and 1288, he does not confirm the episodes that are described, considering them a little ridiculous. And nothing more said. Read the statement, ratified and will sign.